always been very active, walking , climbing, caving in my younger days, then into canoe camping in Sweden, which I still do, and dog-sledding expeditions in the Swedish arctic. A few years ago started to learn to fly but decided it didn't give me what I was looking for so turned to sailing. Got my competent crew and day skipper in the solent in England, including some very interesting winter sailing!. Also got my vhf radio operators licence. I've subsequently chartered 14m boats in Greece as skipper and toured the Saronic gulf on a few ocassions. Recently been sailing in the solent on multiday trips including a crossing to Cherbourg and along the french coast. Had a week of light winds touring the inner hebrides in summer and a 1000 mile delivery from the med to Coruna in September. October saw me sailing from Madeira to Tenerife and my dream was realised in November/december 2018 when I sailed across the Atlantic from Cape Verde to Martinique. 13 days and 6 hours, average 6.5 knots. 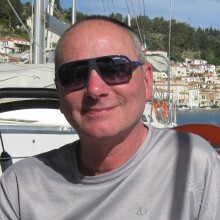 Retired earlier this year ( I'm 63) I'm looking to do more sailing in the future, both European and further afield. I like to think I'm a decent cook ( I can manage bread, scones and yorkshire pudding on an atlantic crossing if thats any measure..) and don't get sea-sick. A previous career in the fire service means I can get on in a team having to live and work in a close environment. Non-smoker, eat anything, but still appreciate good vegetarian food if thats your thing. Married, 2 daughters and 2 grand-daughters. I have a house in France which I visit regularly, but still try to spend as much time as possible on the water.